See our Policy page for details on our Creative Commons license policy. 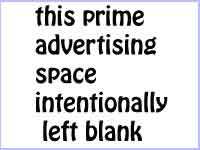 You are welcome to link to any HTML page on this site, just not directly to an image file. For any other matters please contact Steve. 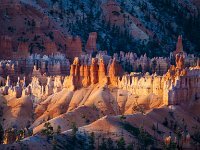 In June 2017 we popped in to Bryce Canyon National Park for a second visit, with my goal being to capture the world famous sunrise as it casts dramatic shadows on the columns of hoodoos. Presented here are the 28 best images from that morning. In November 2016 we celebrated our twentieth anniversary with a trip down the Oregon Coast, continuing back into far northern California to see the Redwood forest. 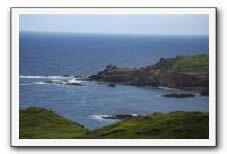 Recently The Google chose to create animated GIFs from some of my 2008 Galapagos Islands photos. I have collected 50 of them here, hope you enjoy seeing these amazing creatures from an isolated island chain. These are kind of cool. Please feel free to share a link on your social feeds! In November 2015, despite the winter weather, we toured all 5 of the national parks in Utah. It was the first time away from home for my newly acquired Pro series Olympus telephoto lens. Using it with an Olympus OM-D E-M5 mirrorless body I was able to capture some of the best photos I've ever taken. I was thrilled to the core with this trip and the fantastic scenery. At Bryce Canyon my shutter finger went wild. Here I've created five subfolders, each containing all of the post-processed shots from one of the five National Parks in Utah. Enjoy! The people of Utah were universally friendly and helpful, I recommend this trip. Because I also upload my photos to The Google, from time to time they detect a sequence of related shots and make an animated "Auto Awesome" GIF. I've gathered a bunch of these and made an animated photos gallery. Included are quite a few animations of hummingbirds shot here at Geek Hill. You'll also see a grandson eating macaroni and cheese, turkey vultures in one of our trees, and a gadget charger made by me. Also there is Jens Voigt riding in stage 1 of the 2014 Tour de France. In early July 2014 we were already in Scotland visiting family when we popped on down to Reeth, England to catch Stage 1 of the 2014 Tour de France. It was a sort of a bucket list thing. Of course I took well over a thousand photos, but here they are whittled down quite a bit. 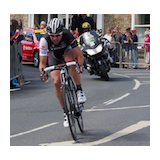 As the scene begins Jens Voigt, the oldest man in the race at 42, is leading the stage through Reeth in the Yorkshire district of England. He would be overtaken before the end of the stage, but in the meantime thousands of people were cheering him on. Yorkshire is a lovely part of England with friendly, happy people. Worth a visit without the Tour. In August 2008 we joined a number of our friends from the James Randi Educational Foundation on The Amazing Adventure 3, an expedition to the Galapagos Islands. In November 2013 we revised and re-processed all of our photos from Galapagos using newer methods and technique. During that wonderful trip 5 years ago we saw dozens of unique species of wildlife that had evolved in this isolated chain of volcanic islands located 600 miles west of Ecuador in the Pacific Ocean. We were literally following in the footseps of Charles Darwin as we visited this one of a kind place. Together with our trained Galapagos Naturalists we ventured forth each day to one or two new locations in the islands, seeing fascinating new sites each time. Join us in these hundreds of photos as we journey into the world of reality, no Imaginary Bearded Sky Daddy will be required, you will see the Origin of Species at work in the natural world, we hope your understanding of what is real will evolve as a result. Now that we are settled in at Geek Hill there are many great opportunities for taking photos right here on our unusual and eclectic property. 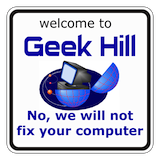 We have added a new subfolder just for our ever increasing collection of Geek Hill photos, and naturally enough we called it the Geek Hill Gallery. Inside you will find photos of hummingbirds, hawks, trees, flowers, koi, tomatoes, and more of the amazing views from the top of the hill where the Geeks live. Living at Geek Hill is a little bit like being in a nature preserve. With so much wildlife and natural beauty it is easy to fill the frame of any camera. See what you think in the Geek Hill Gallery. In August 2011 we moved to a very unusual hilltop home with spectacular views of the Southern California region known as the Inland Empire. In this album you will find mostly time exposure tripod mounted shots made with my Canon 5D DSLR looking in various directions from the deck that surrounds our new home, which we have named Geek Hill. The freeway visible in many of these photos is Interstate 15. The climate at Geek Hill is quite noticeably cooler than it was in Palm Springs, where we lived for many years. Instead of running the air conditioning all night we are able to open the house up to wonderful cooling breezes. Our new home also features a koi pond, a swimming pool, a spa, a gazebo, and very unusual architecture inside the main house. In May 2011 we visited Sequoia National Park along with my beloved In Laws from Scotland. There had been late winter storms despite the date near the end of May, and at higher altitudes we saw rain, sleet, hail, fog and snow. 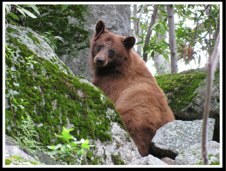 On our way back down the mountain we stopped near Hospital Rock and it was there that we saw a beautiful brown bear. The weather did not keep us from having a good time, and I might be persuaded to head back up there sometime when a major road construction project is done. 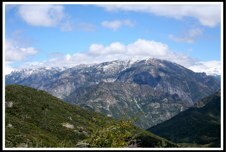 We'll be heading back to the other side of the Sierras again in summer 2012, watch for more mountains. The day after Sequoia National Park we visited Kings Canyon National Park which is adjacent. The winter storms had closed the high altitude road between the parks, so we drove around through the Sierra Nevada Foothills to enter Kings Canyon National Park from the west. The weather was much nicer but at the higher altitudes above 6,000 feet there was still plenty of snow. We walked around a trail to see Grant's Tree then continued to the end of the road traveling east through scenic mountain areas. All of the snow melt provided lots of waterfall activity. 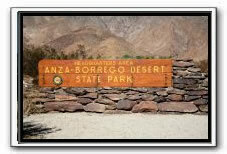 In September 2007 we drove South almost to Mexico to visit Anza Borrego State Park, which is just west of the southern end of the Salton Sea. There are numerous varieties of cacti in the park, and areas where erosion has created badlands that are quite scenic. We also took a drive to the tourist town of Julian, arriving just by chance when the Angel Fire was starting. We had no difficulty avoiding the fire as we quickly exited the town and returned to our hotel in Borrego Springs. In July, 2007 we flew to Texas to attend a birthday party for the wife of an online friend of Terry's. 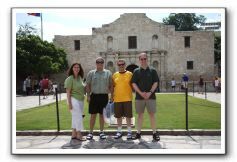 Then another forum friend took us on the Death March, as she called it, but I'm dubbing it the Armadillo Tour of Texas. From the party, through Waco and Crawford, on to Austin, then to famous San Antonio. Finally in Houston we visited the NASA Johnson Space Center. Five years have gone by now and these are still some of my favorite photos. Don't mess with Texas! 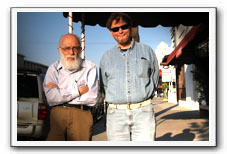 On Friday, May 11, 2007 we drove to LA for dinner with The Amazing Randi, who we know through our involvement with the discussion forums at the James Randi Educational Foundation. Randi is world famous as a magician, a skeptic, and a very successful debunker of charlatans, phony spiritualists, supposed psychics, and promoters of New Age woo woo medical frauds. We have a very high opinion of Randi, so it was a real treat for us to join with about 20 other JREF members for a pleasant evening at El Coyote restuarant in LA. I received a gift of a light tent with lights for the Solstice in 2006. Naturally I had to use it. So I took the Bobblehead used as the photographic basis for my original religious satire site, Jaheezus.com, and used it along with my recently acquired Buddy Christ Bobblehead. On the ninth pass I got a set of Bobblehead bouncing photos that I liked. Finally I ran the selected shots through the Apple Mac program Comic Life to add captions. Before I knew it I was creating a photo-based comic strip. 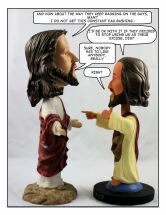 I hope you will enjoy Buddy Christ Meets Jaheezus. Besides photography our next most favorite thing is making fun of silly old religions. In November 2006 we went on a vacation trip to the island of Maui in Hawaii. We were celebrating our ten year anniversary as a couple. We rented a condo for a week, and took lots of photos on the island. One day we went out on a glass bottom boat. We also saw the Iao Needle and I took some photos of water running over rocks. And we took the Hana Highway to Waianapanapa State Park, seeing lots of waterfalls along the way. Perhaps one day we can return to the 50th state to see some of the other islands.